First of all, thanks for all of your input on my handspun blanket. This time around, the oranges have it, and I am hoping to make some time to wind yarn later today! Meet the first pie (for me) of fall. Pears from the tree in the yard of friends, plus one apple to fill out the pie pan, and a crumb topping. Delicious. In fact, this is reheating in the oven right now. I plied most of my SCF bfl in the reflection colorway while the pie baked, and today I have plans to wash the yarn and set the twist. 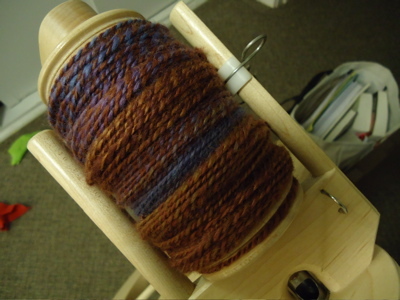 This entry was posted in kitchen, knitting, spinning and tagged apples, baking, BFL, kitchen, knits in action, pears, pie, plying, reflection, SCF, spinning, sunday market shawl by barefootrooster. Bookmark the permalink. I am in LOVE with this yarn. Those colors are perfection. What are you going to make with it? 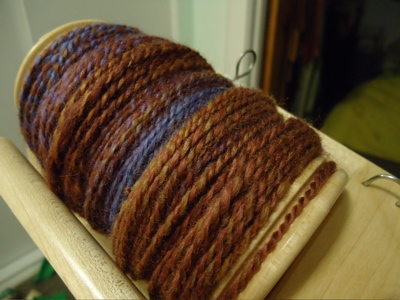 I love spinning BFL. Yours came out so nice. I haven’t decided what to do with mine yet. Yum! That pie looks awesome. 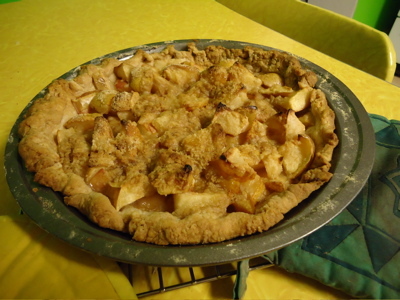 I haven’t made a single pie yet in 2010 — maybe it’s time to change that! Your market shawl looks very autumnal — great time to break it out. 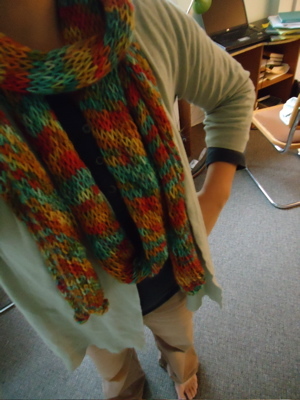 I’ve NEVER worn the market shawl I made. In fact, I may just rip it out and reuse the yarn. I’m drooling over your pie and shawl! YUM!